Source of Earliest Record: Haiyao Bencao. Part Used & Method for Pharmaceutical Preparations: The pearl shells are collected and ground into powder. Properties & Taste: Salty and cold. Functions: 1. To pacify the liver and subdue the yang; 2. To clear heat in the liver and brighten the eyes. 1. Deficient blood in the liver manifested as blurred vision and night blindness. Mother-of-pearl (Zhenzhumu) is used with Atractylodes rhizome (Cangzhu), Pig liver (Zhugan) and Chicken's liver (Jigan) or Rabbit's liver (Tugan). 2. Deficient yin of the liver and kidneys and hyperactivity of liver yang manifested as headache, dizziness, vertigo, tinnitus, irritability and insomnia. Mother-of-pearl (Zhenzhumu) is used with White peony root (Baishao), Fresh rehmannia root (Shengdihuang), Sea-ear shell (Shijueming) and Dragon's bone (Longgu). 3. Wind and heat in the liver meridian manifested as red, swollen and painful eyes and photophobia. 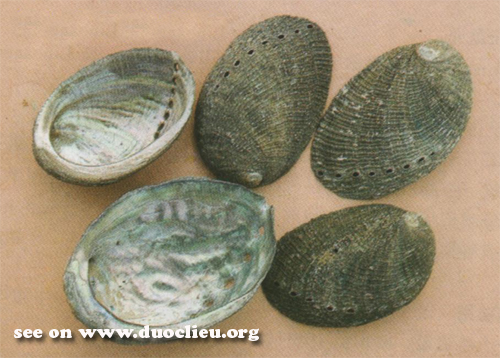 Mother-of-pearl (Zhenzhumu) is used with Chrysanthemum flower (Juhua) and Plantain seed (Cheqianzi). Dosage: 15-30 g; 0.3-1 g (for pills).